Do you want a website that will earn you money with little effort from you? Maybe one that will give you income for holidays with your family? This will be possible if you had a website that earned you $1000 or more. This is possible even if you have not built a website in the past or are new to the world of online marketing. If you have experience in building a website, then this will be easy for you. Before you start building the website, you need to be persistent; the reason why many people have failed is because they give up too soon. Aiming for $1000 per month is reasonable; you will only need to make $34 in a day. You can sell a few high priced products or plenty of low priced affiliate products. You can sell a product of your own priced at $35 and you will be set if you only made a sale in a day. The thought of how easy this is will earn you more than the target we set. Should you go for authority or niche sites? There is a difference between an authority site and niche one. With the authority site, it seeks to command authority in the industry. This site tries to be a content hub and for you to keep the site relevant you need to keep it updated. As for the niche sites, they are a bit different. These sites tend to be filled with evergreen content and get updated sparingly and this is done to add new products and promote deals. 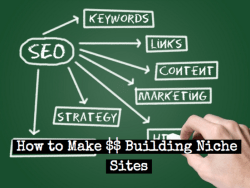 The niche sites do not need you to do a lot for its upkeep and this is what makes them good for making money. ← How should you resell site traffic?